Which Linux distro has the full OpenOffice package? 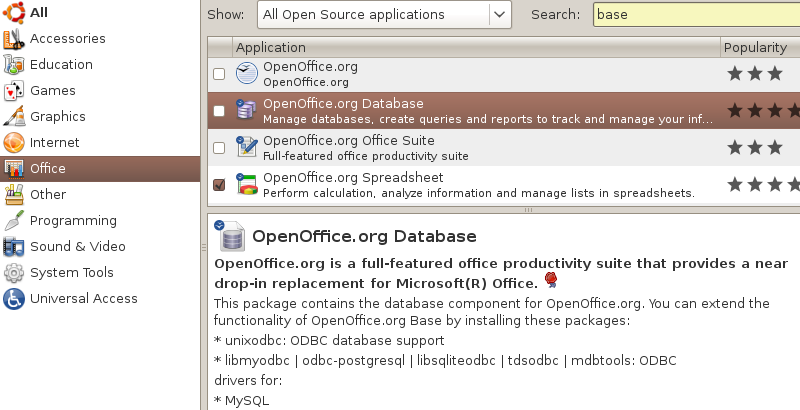 You can install OpenOffice Base from the 'Add/Remove Application' Gnome user interface. I think that the package is not included in the default installation because it's not used that often (and Ubuntu still runs out of a standard cd). Tough Synaptic is not the same as the Add/Remove Applications thingy but they do the same job. Try to start a Terminal. In Gnome:Application->Accessories->Terminal .